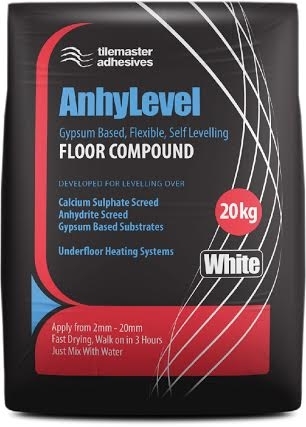 AnhyLevel is a low emission, high performance, gypsum based self levelling compound designed for smoothing and levelling subfloors prior to the installation of floor coverings. 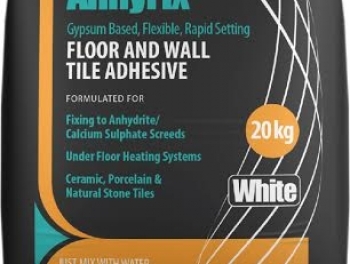 AnhyLevel is a gypsum based self levelling compound that has been primarily developed for application to calcium sulphate/anhydrite screeds and gypsum based substrates. 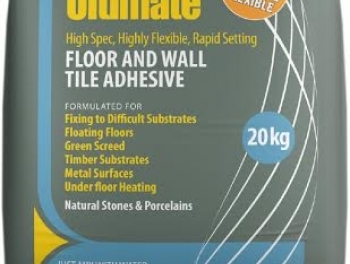 AnhyLevel is also suitable for application to more common substrates such as sand/cement screeds, concrete, flooring grade asphalt/bitumen, existing ceramic tiles and underfloor heating systems. AnhyLevel can be applied from depths of 2mm - 20mm in one application without the need to add aggregate. AnhyLevel is fast setting and will accpet light foot traffic after 2 - 3 hours, final floor coverings can be applied after 24 hours. 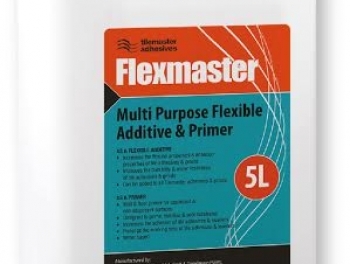 The excellent flow and self levelling properties of AnhyLevel provide the perfect surface prior to the installation of floor coverings such as decorative vinyl's, linoleum, laminate, carpet, resin, ceramic, porcelain and natural stone tiles.